2. Why no sat-navigation at this cost. It really doesn't make sense to carry a tom-tom and charge wires when this machine is really built for off roading and ENDEAVOURING into wild. It was already termed a 'gremlin' before even you could know if it was differential oil leak or simply some grease. These days its easy, you only have to google to see what a differential oil leak looks like before being conclusive with assumptions. The rust is only on the driveshaft pinion seal, thats not something to be alarmed about! Last edited by anachronix : 17th February 2016 at 16:18. @S2 - Superb review, rating 5 stars. 1. Why no passive key-less entry at this cost. The keys look out dated too. 2. Missing of navigation is questionable. The pinion shaft flange is a forged and machined to spec. component. The machined area is exposed to the elements and a day or two out in the open will see oxidation of the machined surfaces. But these components will generally outlive the vehicle. As anachronix put it, this is nothing to worry about. anachronix, ecosport rules, GTO, nashmkm, S2!!! The torque split is via an active transfer case which transmits power to the front or rear wheel (40:60 rear biased in normal mode) depending on the condition. When I took the TD of the new Endy, I noticed rear wheelspin upon pressing the accelerator. About 0.5 seconds later, the front wheels appeared to have "kicked-in" and taken over pulling the car to increase traction. My Audis (old Torsen diffs throughout) never showed any delay/hesitation/lack of traction, so I highly doubt the center diff is a Torsen unit. Last edited by SuperFlyBoy : 17th February 2016 at 20:25. On the cover for VIN stamp, Ford Figo has one, not like a plastic one the Endeavour has, but a Velcro one. Keyless entry is a miss for a car that costs upwards of 30Lakhs, but personally I don't like it. Main reason, the car should be unlocked when I ask it to, just because Iam near the car with the key in my pocket, others should not open it. My dad has been waiting to buy this car for a long time, he booked a Fortuner almost a year back and cancelled it when Ford first introduced the Everest as a concept. How is the 2nd row seat thigh comfort, his benchmark is an '08 Safari ? How did the headlamps perform, some Fords do a poor job at that (Figo and Ikon) ? Excellent review. I'm actually pretty impressed with this Endeavour, more so now I feel I must make my BIL test drive even this vehicle, although he was seeing a segment much higher than this. Something tells me he may fall for it. Brilliant review guys. If there's one place people turn to for unbiased, honest opinions it's here. I've been resisting the itch to do this. But after doing a similar thing for the Brezza, I thought of doing this for the SUVs as well. It's just so much fun finding the images, adjusting them to the LxH and discovering more about the cars. The Fortuner towers among them all at a height of 1850mm, while the Santa Fe is the shortest at 1690mm. 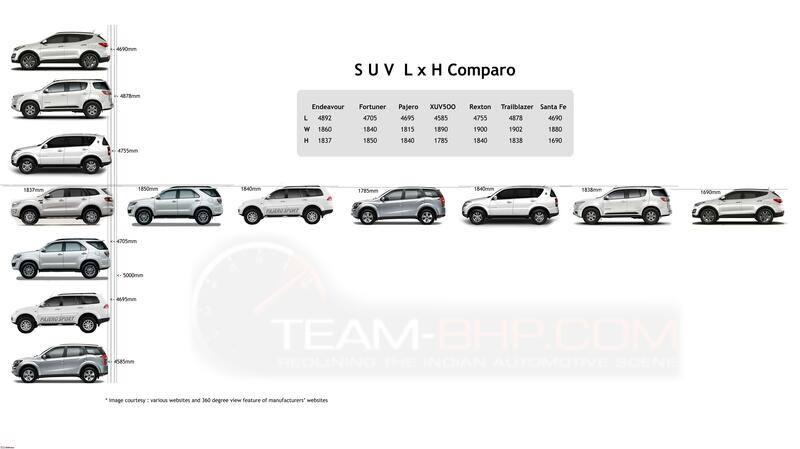 Unlike the sub-4m comparo, the designs of the SUVs are refreshingly not similar to each other. I feel the side stance of the Santa Fe futuristic and slick. Do click on the image to open in a new window. As always there might be slight approximations due to the angle in which the snaps might've been taken. This is not 100% accurate. Saw the Endeavour in flesh today while going to office. It is fabulous and have never seen a better road presence of a car this side of Rs. 50 lacs. Fortuner looks dwarfed and has a worthy competitor to look forward to. @s2, superb review and a deserved 5 star for the efforts!! Being a Ford follower, I was eagerly waiting for this one and this has come with a bang. Thanks a lot for covering every minute detail of this Big machine from Ford ! I always liked the Endeavor since it was first launched, it always gave a strong muscular feel, but then Ford was never able to get a stable market share. Since, Fiesta/Figo success, Ford has re-established themselves in the market and now people have started to trust and buy Ford vehicles much more than earlier times even in tier 2 cities. 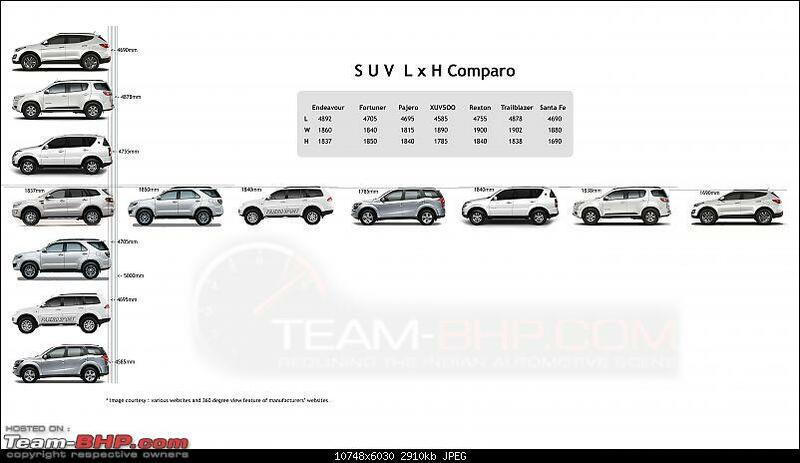 Hope the Endeavor is able to compete head on with Fortuner, even in the review almost every thing has been compared with the Fortuner, I feel the car should be given its original identify rather than making direct comparisons. anyways !! The pictures and videos have been really helpful in understanding the review better, claps for the pics !! As mentioned already, I too wish this had come with a MT in 3.2 L variant, Always feel MT more fun to drive with the control. Hope to get behind the steering of this beast soon !! Much deserved 5 star rating. I always wonder how is it possible to review an automobile to such depth. At this rate, Team-BHP's reviews will give serious run for money to Auto publications. It took full 2 days for me to read the full review in whatever spare time that I had and hence the late reply. Fantastic review!! The parallel park assist feature looks so funky. Such a helpful feature to have for a big vehicle like Endeavour. Specially in India. Wish Ford and other manufacturers introduce it in some of the affordable cars as well. Excellent review, of the beast, as always. Thanks S2!!! Rated the thread well-deserved 5 stars. The Endy definitely looks butch and muscular and modern - that's an amazing combination. Compared to this, T-Fort surely looks plain and boring and hope Endy gives T-Fort a run for its money. I, for one, not a fan of the Start-Stop button with key-less entry for SUVs - this beast has to be cranked old-school not with some buttons.